The phenomenon of superheroes in GTA games dates back to Vice City, when modders added the iconic Superman suit to the game, complete with the ability to fly. Such early mods relied on simple model changes and only introduced limited features, but they still were downloaded thousands of times from various modding sites. Later, more sophisticated mods, like the GTA IV Iron Man mod, allowed players to do fly, fire missiles, and shoot lasers while also sprucing up the in-game menus and HUDs. Nowadays, every superhero you can think of is available in GTA via a mod—just to name a few, there’s The Flash, Batman, Iron Man, The Hulk, Wonder Woman and many many more. One fan favorite GTA IV mod allowed players to become Spider Man. This mod, which allowed players to web sling around Liberty City, was created by JulioNIB, one of the most prolific and popular GTA modders. It was a match made in heaven: players could zip around, fight criminals or the police, catch a ride on a helicopter and climb buildings. The impact of super hero mods on the GTA community goes beyond what people actually play. 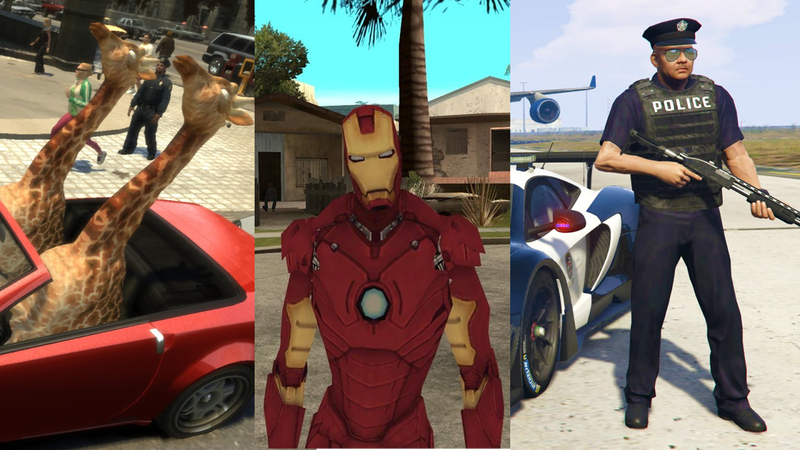 Since their introduction, GTA super heroes have blown up on YouTube, where kids watch series that incorporate popular characters from movies like Cars and Batman. Given how much GTA games are about cities, the popularity of superhero mods makes sense. All cities need saving, and that’s especially true in the GTA world, where crimes happen every minute of every day. Zombies are everywhere, so of course they pop up in Grand Theft Auto. Typically, zombie mods turn cities into burning wastelands filled with the undead, which players can wipe out using powerful weapons. These mods are impressive because they feel way more like DayZ, especially when combined with wasteland mods, which transform Los Santos into something new. Other popular zombie mods include Left 4 Theft, a GTA San Andreas mod with 800,000 downloads, and Raccoon City Stories, a Vice City mod that is still being updated and played in 2017. On YouTube, San Andreas zombie mods are still big enough to garner nearly half a million views. Zombie mods are also a really popular tool in creating machinima videos, like Afterlife, a zombie series made in GTA San Andreas. GTA games are a perfect fit for these mods because most modern zombie games, like Dying Light and Dead Island, are also open-world. GTA games have a longer history of creating huge, detail-oriented worlds, so players hungry for zombie games can live out that fantasy in a space that lends itself to the genre wonderfully. GTA fans have access to tanks, jetpacks, fighter planes and BMX bikes, but no skateboards. Maybe this seems like a strange thing to want, but it’s all based on the design of the cities themselves. GTA IV has a skatepark. San Andreas has a skatepark. GTA V has a skatepark. And yet, no skateboards. This is where modders come to the rescue. One of the earliest skateboard mods came in 2005, when modders like ms.cooldude dug up files in San Andreas that referred to a an unfinished skateboard model. Modders took these leftover bits, finished the skateboard, and made them rideable. The assumption was that Rockstar was going to make skateboards into melee weapons, so modders added that functionality too. Modders have also created skateparks and new skating clothes for various GTA games, including Vice City, GTA IV and GTA V .
Nearly every 3D GTA game has inspired first person mods, and it makes sense. The streets of Vice City and Las Venturas feel different when looked at from a new perspective. First person mods are relatively popular, with some being downloaded over 200,000 times. It wasn’t until GTA V was re-released on PS4 and Xbox One in 2014 that Rockstar added its own first-person mode, though modders discovered that the developer had tested the feature over the years. Great minds and all that. Grand Theft Auto can be a zany franchise that includes things like a magic dog and a moon that changes size. Modders have taken that wild vibe and run with it. In GTA mods, you can find things like the toy dinosaur Rex, from Toy Story packed with a machine gun, urination, and parkour. Why not? Then you’ve got the weird vehicle category of mods, which include a drivable picnic table or a go kart made out of a toilet. Perhaps one of the most famous weird GTA mods is one that adds a giraffe. This mod became a bit of a viral sensation in 2012, with nearly a million views on Youtube. As a member of the GTA community, things can sometimes get kind of toxic and aggressive. People will yell at you for failing a heist, or they might use cheats to mess up your game. But, that’s not all there is to the GTA fandom: sometimes, all you want to do is do some backflips as Tommy Vercetti, or some other random nonsense. GTA mods let fans experience the game however they want to play, no matter how silly. Somehow, it all works. Nowadays, GTA modding is bigger than ever thanks to YouTube and Twitch, where personalities role-play, make machinima, or enjoy the chaos of Los Santos in front of large audiences. Anything and everything is possible with modern GTA mods.You can dispense justice as a police officer or mess with the GTA universe as Rick from Rick & Morty. Between constant visual mods that upgrade the graphics of GTA games and the ongoing enthusiasm of GTA communities, older GTA games are always kept up to date for new hardware and changing public taste. 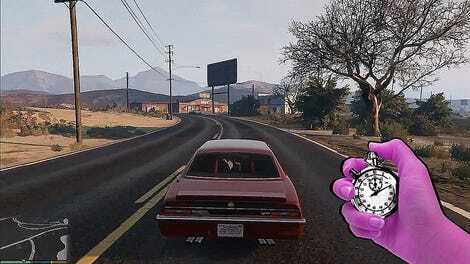 Even the mobile versions of GTA have mods, proving that no matter where GTA is released, players will want to mod it. The freedom of the open-world format with the endless possibilities of modding makes for a tremendous pairing. Given the history and influence of GTA mods, it’s no surprise that the short-lived crackdown on mods earlier this year upset so many players. Mods are an integral part of the GTA experience, and for gaming culture at large. Even if you don’t use GTA mods, you’ve probably enjoyed a viral GTA modding video at some point, or subscribe to a personality who uses mods. So here’s to another 20 years of delightful, exciting, and strange GTA mods.